Frosty. That was this morning. Grass, branches, porch railing, stones–all frost-covered. The air was still. I rose before the sun crested the mountains, walked into the morning. The ground was frozen, so walking was easy and quiet. I wore a down jacket. Despite the cold, a few degrees below freezing, the blackbirds sang. Song Sparrows tried their best to stake out their territories. Over a hundred geese flew overhead. Yesterday’s puddles sported white caps of ice. In the river, a beaver broke the water’s surface, swimming around the bend. A mink bounded along the shore, pausing to watch me as I watched it. The river babbled its usual course under the bridge. When the sun appeared, it spread light across the fields, melting the frost. In the shadows, ice held on. Soon enough, those crystals would droop and disappear. The puddles would be free. Bluebirds would sing as the breeze arose. Freezing nights and warm days. That is just what sugar makers need. There will be some boiling today. I hope to take my empty gallon jugs up the road to Shelburne Sugarworks today to get them filled. They say they will have sugar on snow, but I’m not sure there is snow to be had. Maple cotton candy, perhaps. My guess is they will be boiling today. The weather is just right. 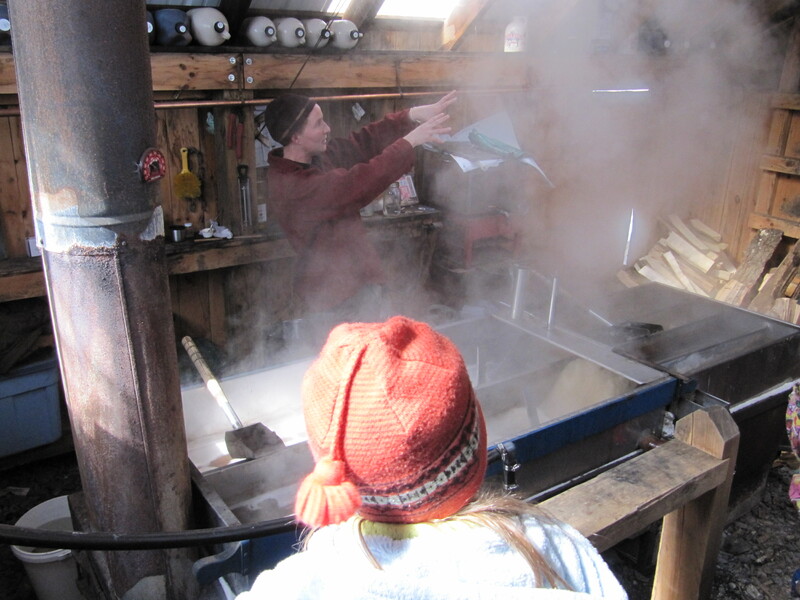 Last weekend was Vermont Maple Weekend. Sugarhouses across the state were open for visitors. We started the day Saturday at Shelburne Farms, with their annual pancake breakfast, a fundraiser for the local 4H. It was not especially crowded. We have attended several years in a row and it is often so crowded that seats at the long tables are scarce and the line for pancakes is long. Not so last Saturday. It was too cold. The temperature when we arrived was maybe 21, 22 degrees, but the wind was whipping. The wind chill was easily in the single digits. Lots of people there were ready for spring, but pushing the season with a lighter jacket does not make it any warmer. My parents were visiting and they were not the only ones to turn back before exploring the sugarhouse. 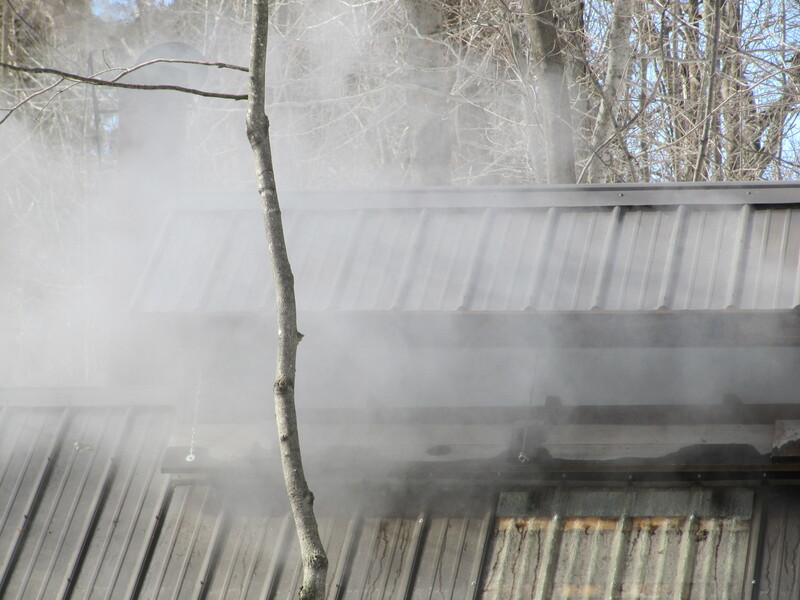 No steam was coming from the sugarhouse roof, so it looked like that refuge would not be all that warm. It turns out they were boiling but they had just started; a head of steam had not built up yet. We watched some boiling and sampled some syrup (it had a hard time flowing from the small paper sample cups given the temperature). 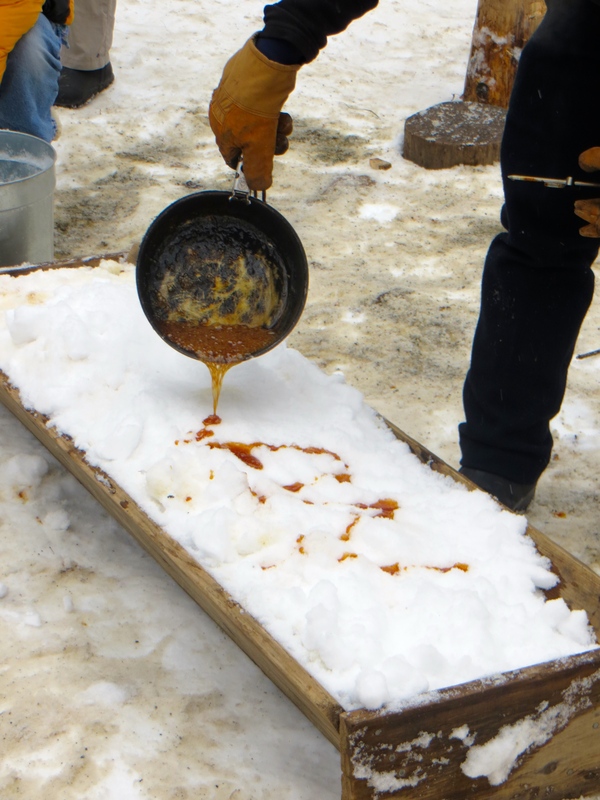 We walked up into the sugarbush and had some sugar on snow. 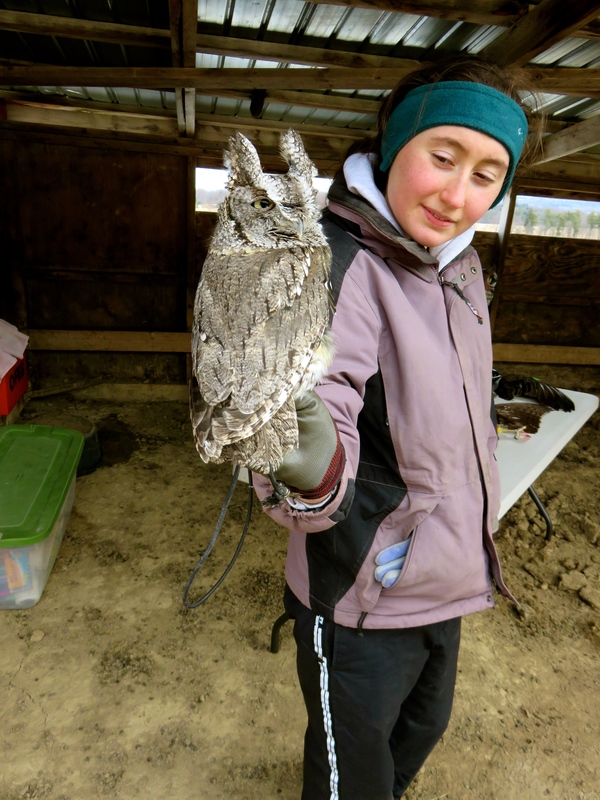 We checked out the live bird demonstration. We had fun but we did not last as long as other years. We got chilled. The next day we went skiing. 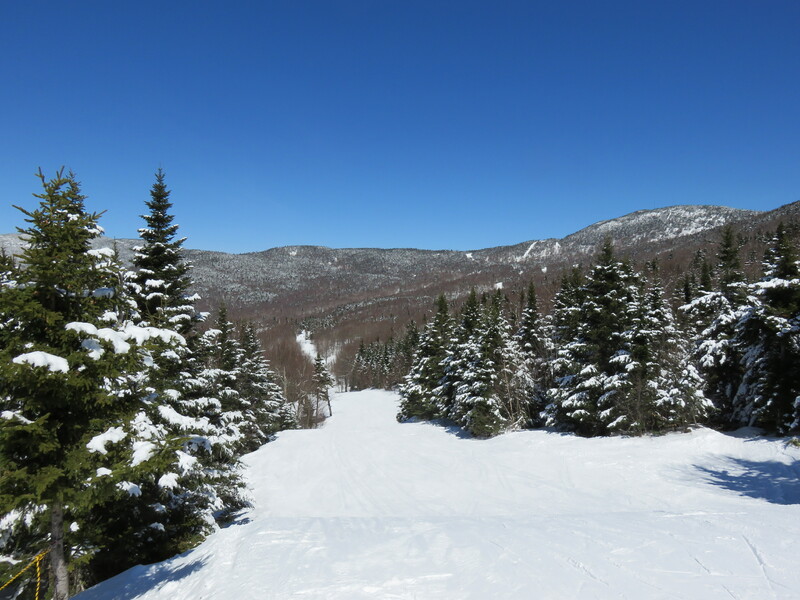 The sun came out and we had a perfect spring skiing day. It had snowed the night before so up high enough the snow was powdery. 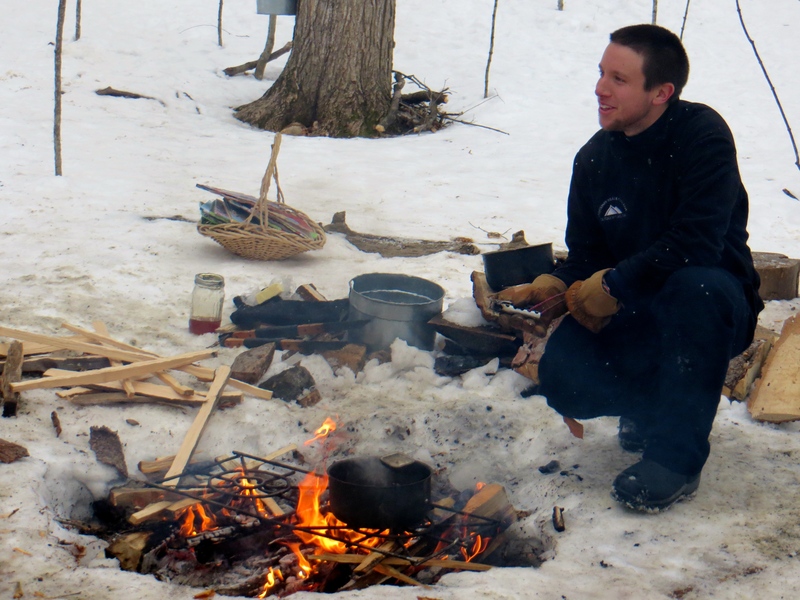 Once the sun warmed things up a bit, the lower snow was corn snow–loose, large grains. We were warm in the sun and skiing down fast. It was a treat. So we started off cold but ended the weekend feeling like spring was ready to really hit us. We made a stop at Shelburne Sugarworks as well, but they were so busy it would have taken a good chunk of time to fill our glass gallon jug. So we put that off. We will need to get over there soon to get that filled up. We will want that sweet liquid over this next year. Those awesome buttermilk pancakes just are not as good without it. 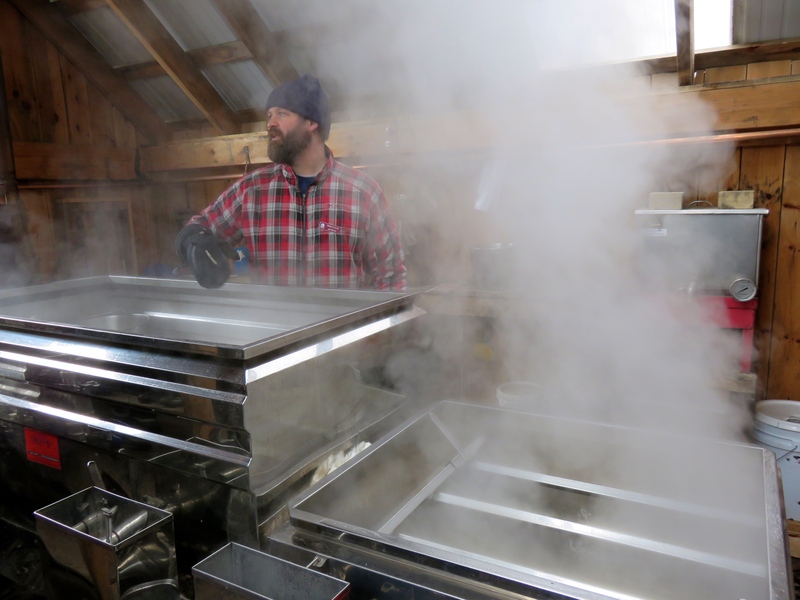 This weekend is Vermont Maple Open House Weekend, where maple syrup producers across the state open their sugarhouse doors to visitors. 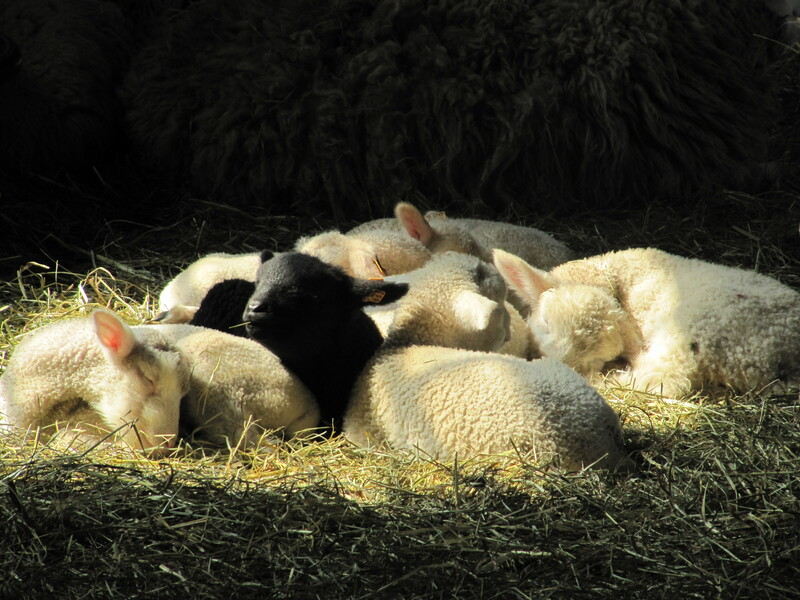 The past few years we have enjoyed starting off the weekend with a trip to Shelburne Farms. They offer a pancake breakfast to support Shelburne Explorers 4-H. The kids who participate are really involved in the breakfast, taking payments and serving pancakes and helping to make sure syrup and coffee are stocked. To be sure, lots of parents and other adults are there to help as well, but I love that the kids are right in there getting their hands sticky. This pancake breakfast is so popular that in the past we have had to wait in a pretty long line to get in. Pancakes were slid onto compostable paper plates as fast as they came off the griddle. Coffee ran out and seating was scarce. It was still a blast for us as a family, including my parents up for the weekend several years in a row. This year, however, I guess we timed it right–no line, no waiting, plenty of coffee and syrup. I think getting there a little later made the difference. One of the great things about this event is that the sugarhouse is so accessible. It is designed for education so there is a platform in the sugarhouse to stand on and watch. 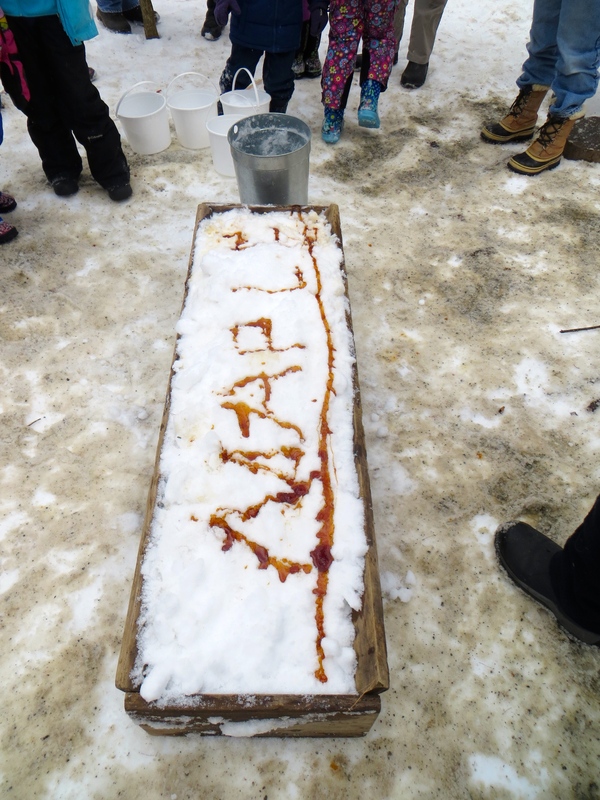 While sap flows have been meager so far this year, they had some on hand to demonstrate the boiling process. 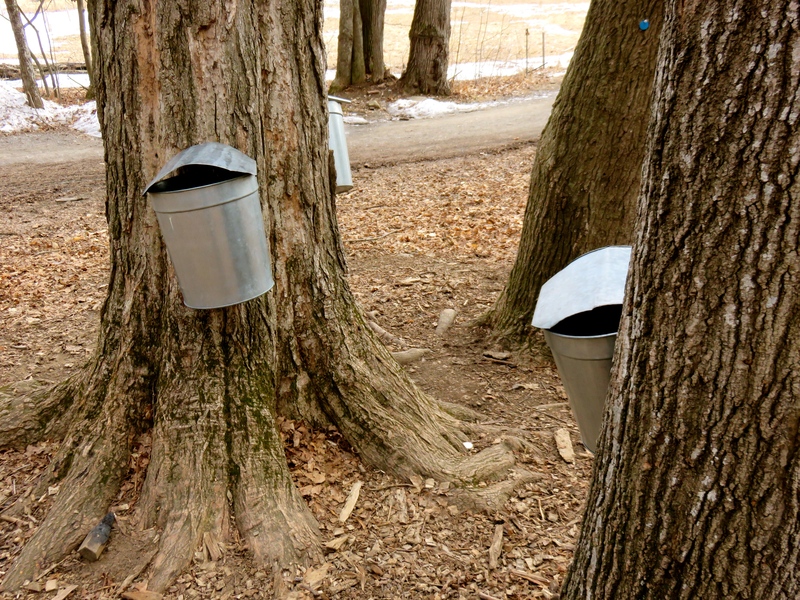 They also scatter small discs cut from maple saplings in the area around the sugarhouse–find one and hand it in for a maple candy. Find one with a maple tree drawn on it and get a large maple candy. Find one with a red maple leaf and hand it in for a pint of maple syrup. My daughter was determined to find that red maple leaf, as she is every year. And this year she did! The mother lode baby. They also have other activities. Help tap a tree. Try sugar on snow. 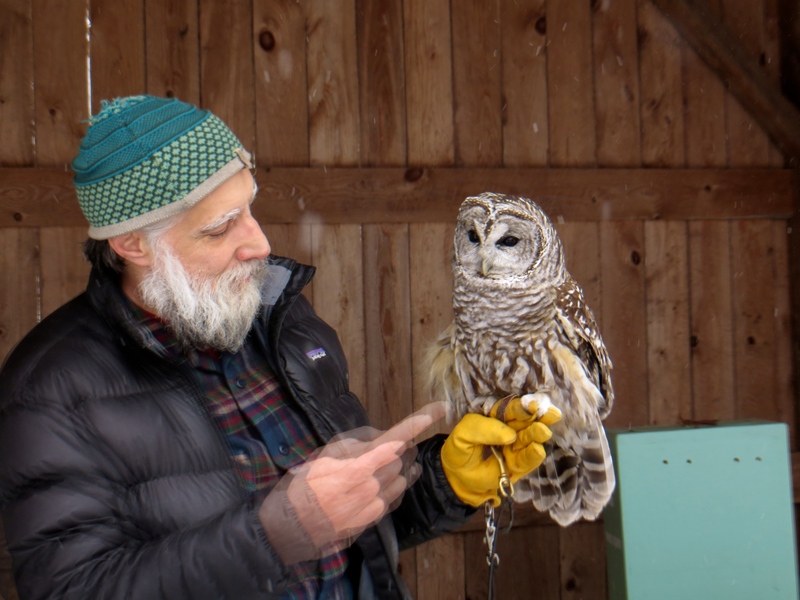 See a live bird demonstration with an owl. Check out the farm animals. It is good fun indeed. 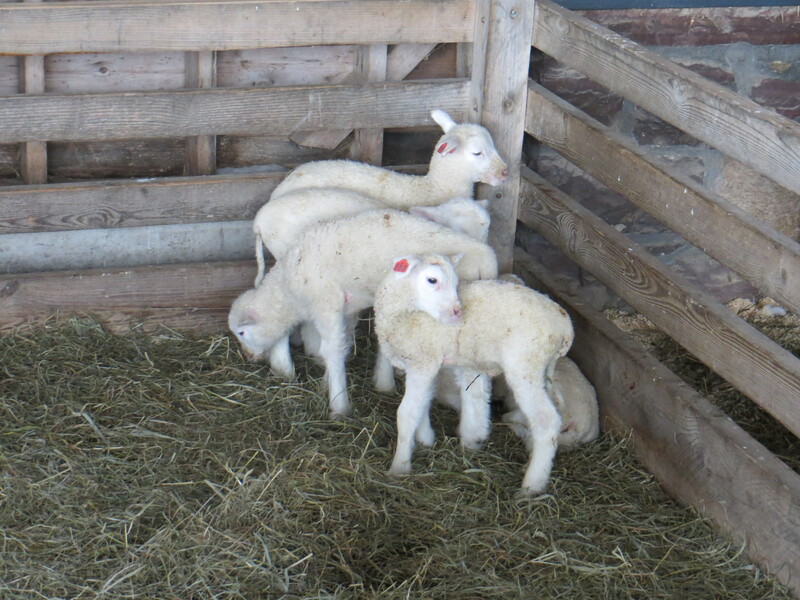 Are these lambs the cutest critters around or what? We didn’t end there, however. We wanted to purchase some fresh syrup. Despite the new pint we are close to out of maple syrup at our house. Last year we probably went through about three gallons for the year. Assuming we get some from our farm share I figured we would need about two gallons. We stopped by Shelburne Sugarworks, right nearby, for our supply. We got a couple of gallons from them last year and so brought in the empty glass jugs. They said they would refill them if we were willing to come back later in the day, so we enjoyed some maple cotton candy, purchased some maple sugar (looks like brownish cane sugar but made maple sap–put that in your coffee!) and watched the band set up. We left before the bluegrass started. My dad and I headed back at the end of the day. We had a to wait a half hour while they filtered and pasteurized it. When we walked out of the sugarhouse I could barely hold the glass jars it was still that hot. I was careful not to slip on the ice. Busting open one of those on the frozen ground would have been a sad situation. Bluebird Pondering Making a February Nest? The site of bluebirds has been pretty common lately. Robins have been around as well. I am not sure if they never left, or if they have just returned way early. I suppose I didn’t see any for about a month, but for the past month they have been hanging out in the maple tree, on the birdhouses, in the pines. It has been mild enough, with little enough snow, that apparently they have enough to eat. Walking down to meet the school bus the other morning I heard a bird singing. Up in a white pine next to the driveway a bluebird was trilling away. Seriously? Early February and a bluebird is not only hanging around but singing? Not even just a simple call, but a song? Too weird. We have lived in this house five winters now and I have seen bluebirds late in winter, but never this early, or as late in the fall, as this season. It has been so warm that we have speculated that the sap is running. Last week we had a stretch of days with highs in the forties and nights with lows in the teens–perfect sugaring weather. Except it is early February. I love bluebirds. I love maple syrup. I love spring. But we have yet to have one big snowstorm. Let me say that again: We have not yet had a major snowstorm. Our driveway was plowed once, twice if you count the sanding when it was super icy. I am not yet ready for bluebirds and sugaring. I am ready for snow. I don’t want to harp on this weather thing, but criminy, can we get some snow already? Today was cold at least. Our high temperature was 12. Yesterday it was 15. If it had been really windy, and we had gotten two feet of snow, it would have been a blizzard. Then I would have been able to say “Poor bluebirds.” Instead I can feel bad for the guy who plows our driveway. So much for that extra income on his part. It was warm again this coming week. I guess those thrushes will have plenty of reason to stick around until spring really does come. And maybe we will get a bumper crop of maple syrup. I mean, heck, why not look on the bright side of this? I can do that for one winter. For one winter. Another winter of this would make me loony. The other morning I went for a run and heard a woodcock doing its spring dance over the field across the road. I am always happy to hear woodcocks in the morning. My heart leaps up, as Wordsworth said, when I hear that bizarre “peenting.” The thing is, however, that the field across the road was covered in snow and ice. It had been flooded so it was like a frozen lake covered in snow. And the woodcock was doing its best to attract a mate. What boys won’t do to get some. Recently there were five different types of birds in the same tree–the same as the one with the blackbird: blue jay, cardinal, chickadee, robin and bluebird. It was a colorful site. 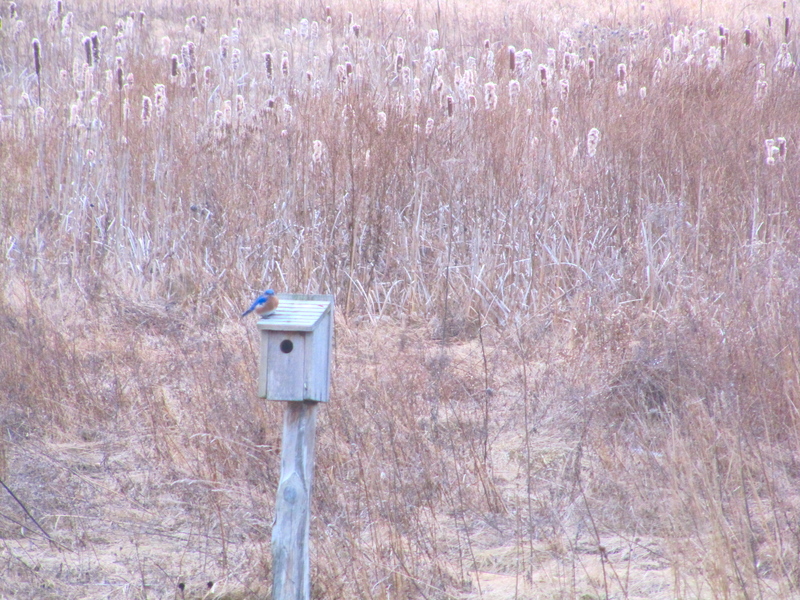 The bluebird kept hopping from branch to bird house. Nesting on the mind. Mud. There is a spot up the hill on our dirt road that makes for a woozy ride. It doesn’t look muddy but the car slides back and forth every time. I love driving that way. The car, of course, is pretty much filthy. Sugaring in on full force. It looks to be a productive spring for sugar makers. Good news for those of us who like love the stuff. Yesterday we had a few good blasts of snow. OK that sounds more like winter, but those wet spring snow storms that look like winter is desperately trying to stick around make me realize that spring really is just about here. Turkey vultures and red-tailed hawks are circling the meadows. Yesterday I drove to work without boots. I just wore plain old shoes. The transition from wearing boots and switching to shoes inside, to forgetting the boots, has begun. Crocuses (croci?) are popping up. Those puppies are sturdy. They had started to pop up right before that two feet of snow. And they are still green. Kids walk to school in shorts and a T-shirt. I keep seeing that. I know that the young set has and will continue to parade to school without appropriate attire for the weather. This seems a right of passage (although I am proud to say I never felt the need to express my coolness through the acquisition of hypothermia) but dude, it isn’t that warm. I mean, we had snow yesterday and today. Wear a jacket dumbass. And there will be more. Leaves haven’t budded out yet. I haven’t smelled a skunk. But in time. Before I know it I’ll be digging in the dirt and planting seeds. I can hardly wait. 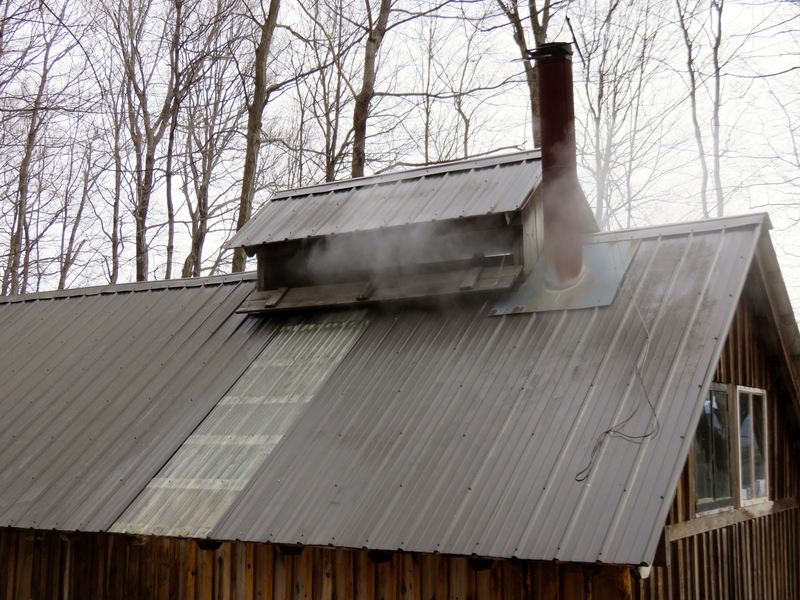 Spring is definitely around the corner when open house time comes to sugar houses around the state. This weekend was it. My daughter and I hopped over the hill to Shelburne Farms for their event. We got there late in the morning and started things off with their benefit pancake breakfast. We ate pancakes with, duh, maple syrup and sipped hot beverages (cocoa for her, coffee for me) before wandering about the animal barns. There was a passel of new lambs we oohed at for a while, guarded by a llama (it sported a hand written sign that read “I Spit!”). Then we made our way up the muddy trail to the sugar house. 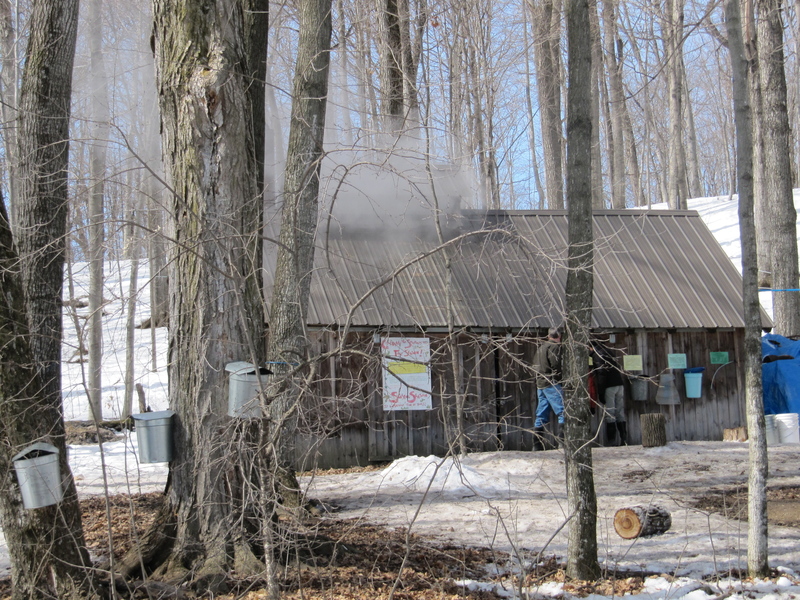 The sugar house was a busy place–lots of visitors and lots of steam. The sap was running and syrup was in the making. 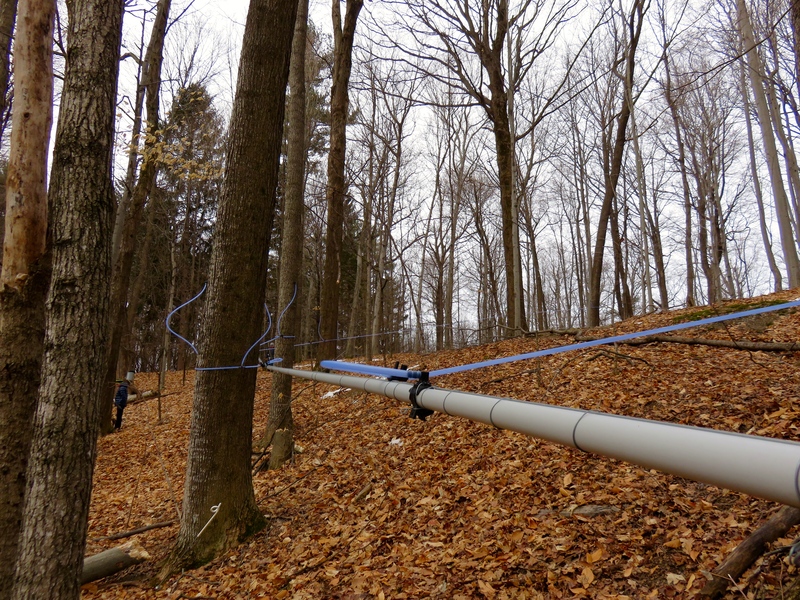 We had the opportunity to taste the generous doses of fresh syrup that volunteers were handing out and we walked up the hill to see the lines–tubes that catch the sap and run it down to the collector to be boiled down. 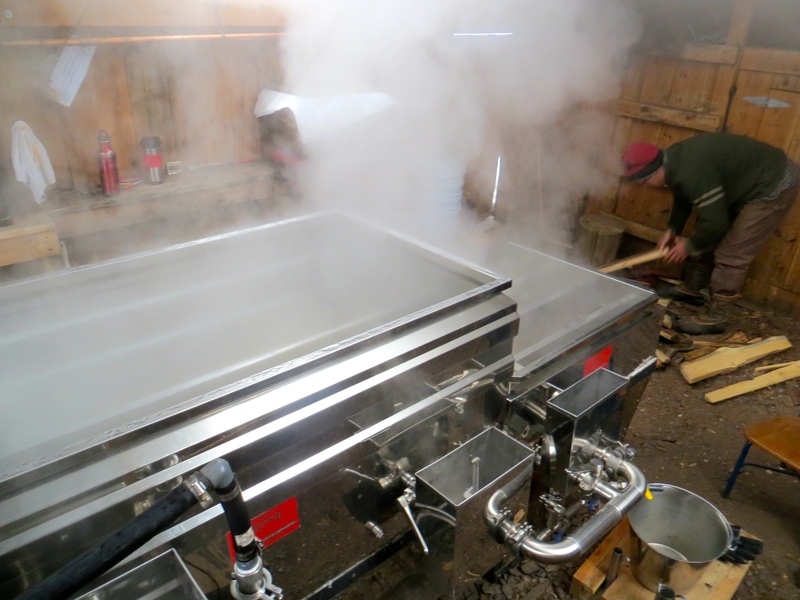 They tap about 500 trees (I paid attention during the lesson) so they make a fair amount of syrup, most of which gets used the in restaurant on site. I will have to head back over there at some point for breakfast. 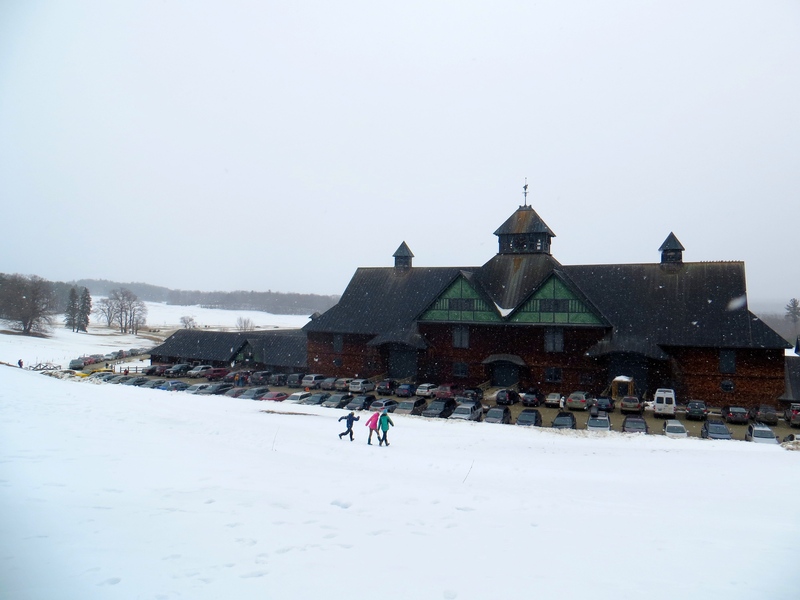 We tried to stop at Palmer’s Sugarhouse on the way home to purchase some syrup even closer to home. We stopped and headed inside but that place was so packed we would have had to wait at least a half hour in line. Forget it. They were boiling like mad with their oil-fueled system–bigger and faster than the system at Shelburne Farms, no doubt. I’ll go back to Palmer’s some time this week and buy a couple gallons. If they still have it. 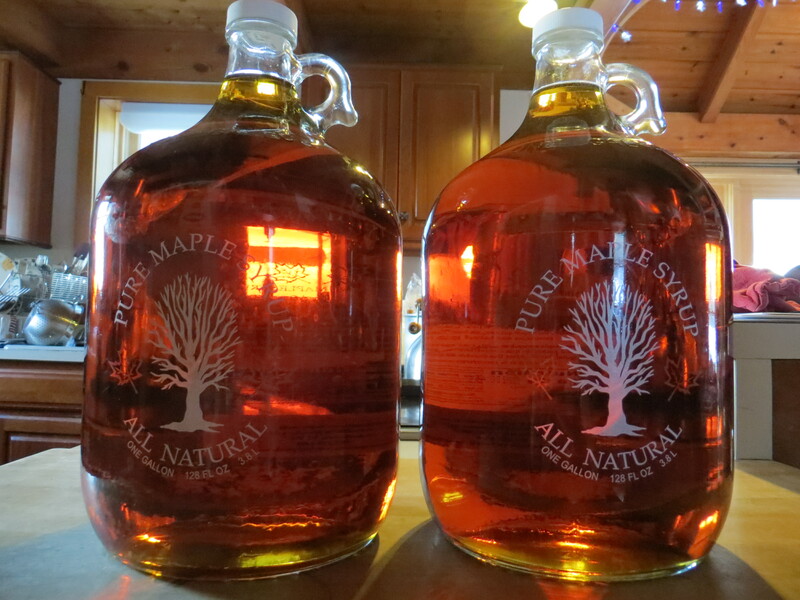 We have enough maple syrup to get us through for a little while, but that stuff is just plain old good. Makes me want to whip up some yeasted waffle batter tonight so we can have them in the morning. But maybe I’m not quite that ambitious. The ideal situation would be if someone else made the waffles. That however, ain’t happening. Maybe next weekend.